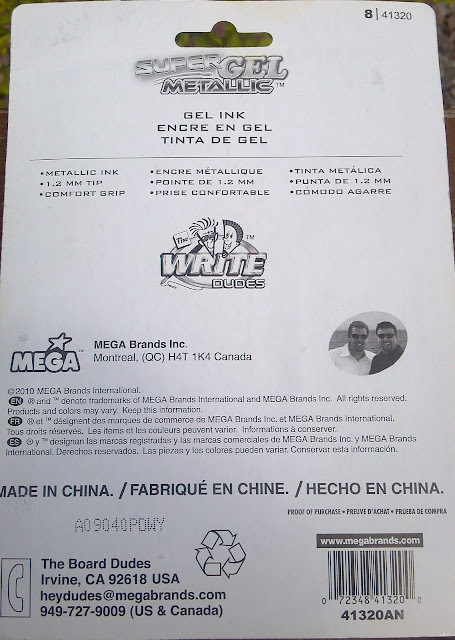 MEGA Brands America, Inc. generously sent a package full of products to review, including this pack of Super Gel Metallic ink pens. This product line is called Write Dudes, which is also part of The Board Dudes, a company that produces a variety of dry-erase boards. As you can see on the back of the package, this pack includes pens with a 1.2 mm tip size utilizing metallic ink. 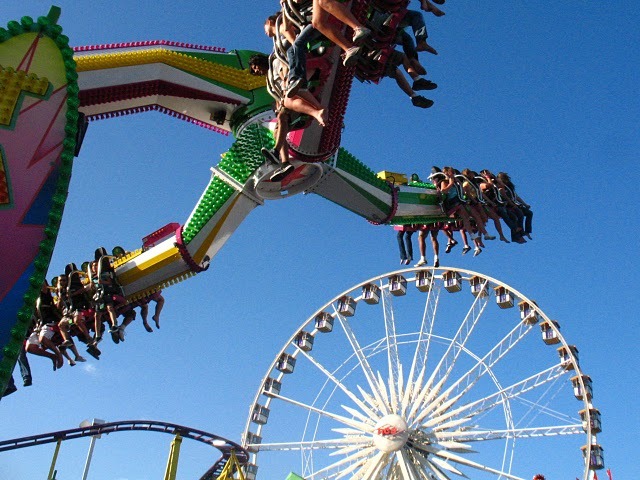 The company is based out of California, and the products are manufactured in China. Upon trying out the samples, I was at first pleasantly surprised by the performance of the blue color. Then I moved on to the purple pen, and it really didn't work, even when I tried using a more "toothy" paper than the Rhodia Reverse Book (shown above) Regardless of what I tried, I could not get the pen to start writing. 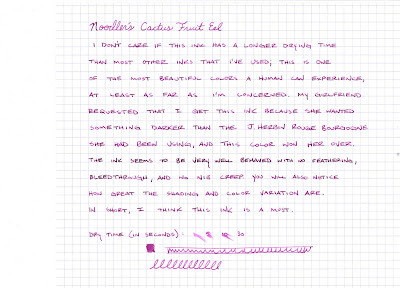 I experienced the same issues with the red and violet pens, which barely worked at all. The orange worked pretty well, and I found it interesting that the color was a burnt orange/copper. 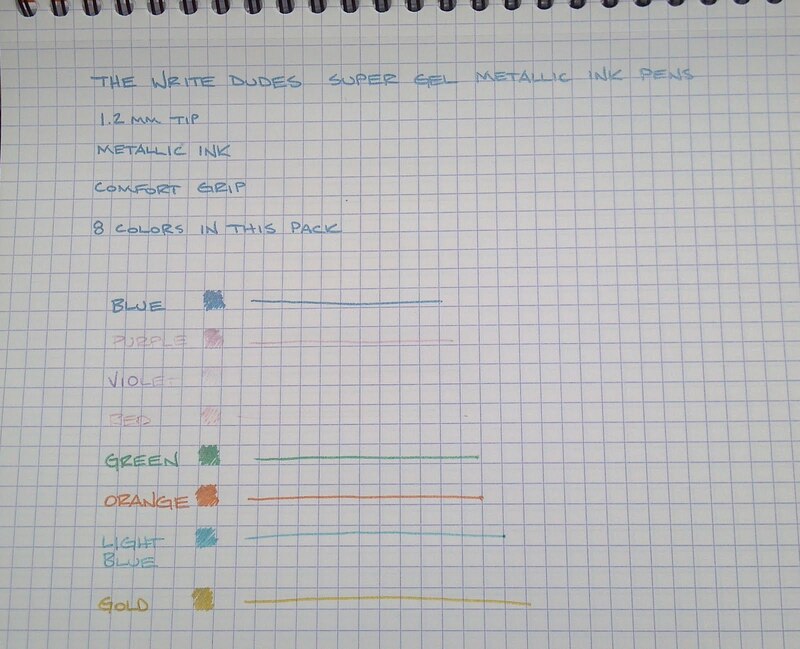 The light blue pen worked for the sample above, and then it stopped working right afterwards. The gold worked well, but the color was more of a German mustard than gold. I think it is an interesting color, but I personally don't think the color is very appealing for most purposes. I've read that these pens are typically sold at Target and Michael's, and I think this particular pack is sold at target for $4.99. The pens were comfortable to hold, but I write close to the end, so I'd prefer if the grip was moved down closer to the tip. 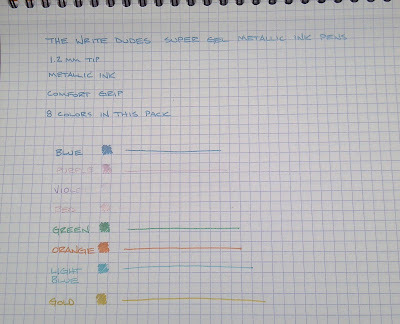 Of the two pens that wrote well, the green and blue, the performance was very good and reminded me of the Pentel Sunburst metallic ink pens. Though it would increase costs, I think these pens could benefit quite a bit from a pressurized cartridge (see: Uni-ball Power Tank), especially when I was not able to try three of eight colors in this pack. If these were available in singles, and I could try them before I purchased them, I might pick up a few to give to my friends that like craft pens. 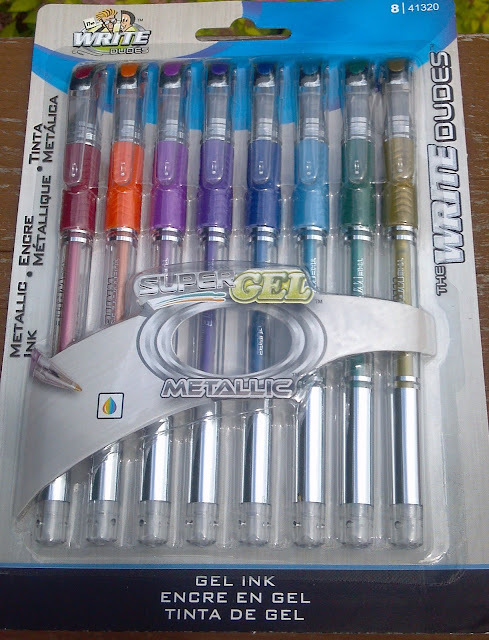 As far as this pack goes, I would not purchase them after having a bad experience with getting the pens to write. 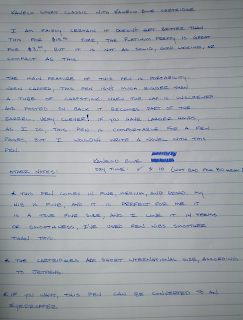 It is just too difficult to ignore the serious quality control issues with the (lack of) performance with the ink. Not much to say about these. They skip often and the ink is pretty faded. There are much better ballpoints available now, so I think only dedicated Pentel fans or very forgiving pen users would enjoy these. Sorry, Pentel, but I just don't like 'em. As with many scanned images, the color in this image does not do justice to the actual color of the ink, which is incredible to write with. I noted how long the drying time takes, and it is substantial on Rhodia paper, but the color is just too cool not to use. I even went so far as to say that this is one of the most beautiful colors one can experience, and when you get a chance to write with it, you will see what I meant. The really dark sentence in the second half of the image is where I had stopped writing for a bit and started again, so you will a range of color, from dark magenta to a bright pink with hints of purple. Being an "Eel" ink, this ink is designed to lubricate the piston filling mechanism of the pen, but I think the lubricating ingredient also translates into a smoother writing experience. 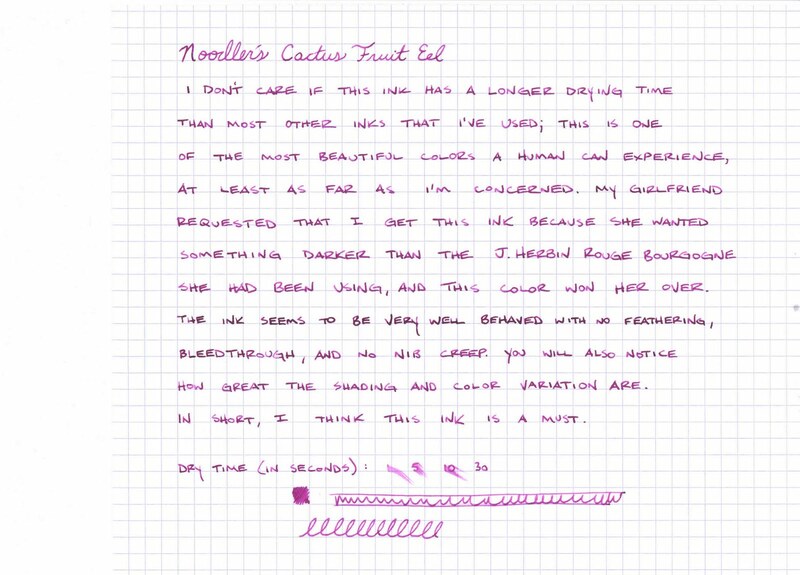 I also noticed this in using Noodler's Gruene Cactus Eel. The paper that I used for this review is the Rhodia Reverse Book with 80 gram graph paper. 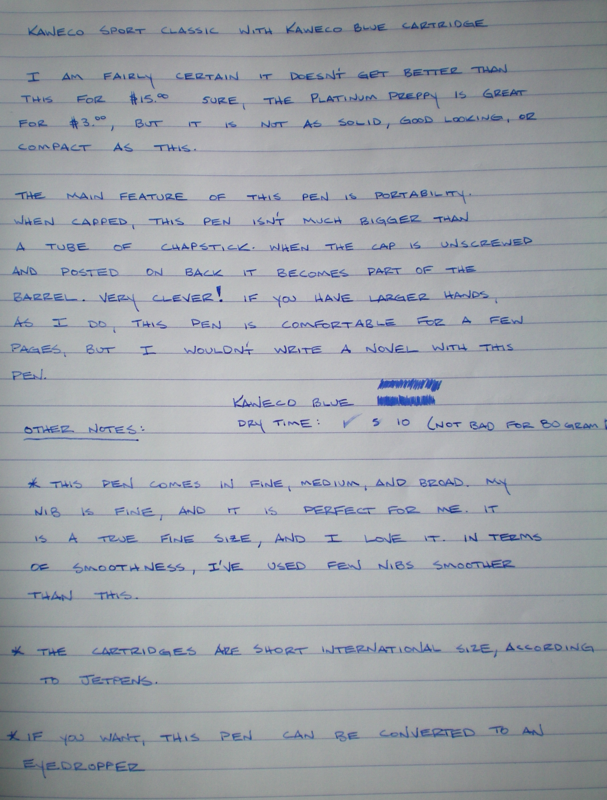 The pen that I used is a Padrino Contour with a medium nib, which I will be reviewing at some point. So, if you are a fan of colors in this spectrum, or you want to branch out more, I think this is an amazing color. If you don't want to invest in a full bottle, I recommend getting a sample from Goulet Pens, which is what I did, because my girlfriend didn't like her bottle of J. Herbin Rouge Bourgogne as much as she thought she did, so now I will probably just get samples before buying full bottles. June Carnival of Pen, Pencil and Paper, by Note Booker, Esq. Note Booker, Esq. has the June Carnival of Pen, Pencil and Paper up, so be sure to go over there and check out the excellent selection of links! I apologize for the photography in the review; these pictures were taken while I was at the cabin, and there was some undesirable weather up there (northern Minnesota). Until the Kaweco Sport, the Lamy Safari was pretty much the only other pen that I was willing to trust not to leak in my pockets. The Kaweco Sport also has a threaded cap for extra protection, which provides additional confidence that a pool of ink wont suddenly appear through my pants. The paper I used for this test is 80 gram Rhodia paper, and the Kaweco felt silky smooth. 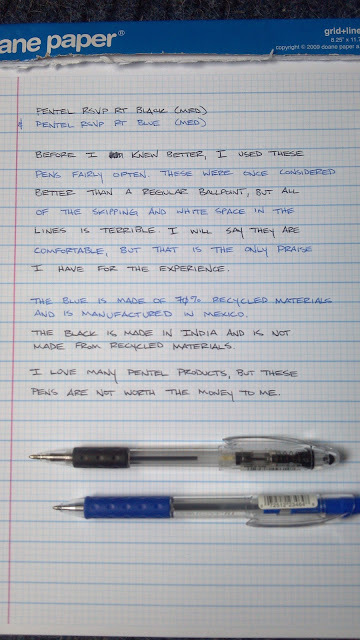 While some fountain pens only feel smooth on higher-tier paper, the Kaweco feels quite smooth on even the cheaper grades of paper that I have tried. Yep, I am really loving this one. What is not visible in this photo is the scratches on the barrel that were inflicted by my car keys. Either way, keep this one away from sharp metal unless you feel that scuffing and scratchers adds character to your pens. "Kaweco is a German company that has been manufacturing fine quality writing instruments since 1883. The sporty and compact look of these fountain pens transcend fashion time and are just as attractive today as they were when they were first created years ago. Each pen is made of high-quality, colorful plastic and is compact when capped (approx. 4.1 inches long), but very comfortable when posted (5.3 inches long). Thus the Kaweco slogan "Small in the pocket, great in the hand". Each pen features a screw-on cap for extra security and a 23 KT gold plated stainless steel nib with an iridium tip. 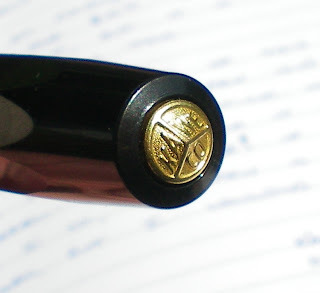 The Germany-made pens reveal a Kaweco metal logo on the top of the cap. One free blue ink international short cartridge is included, more ink colors are available separately at JetPens. Included cartridge will be inside pen upon receipt." Besides the photogenic view of the nib, this image also gives a better idea of what the ink looks like. It is a light, soft blue. It is not very saturated at all, and the overall properties remind me of a J. Herbin ink: well-behaved, dries quickly, and doesn't stain or create concern about potential clogging. I understand if you don't like the opulence of a gold nib, but you might want to let go of that aversion for this one. Okay, so the one major downfall of this pen is that the size more or less prohibits the use of a converter. I've heard rumors that there are some converters small enough to fit this barrel but, in an effort to save on money, I will probably just refill the cartridges or convert this pen to an eyedropper. JetPens has a tutorial on the eyedropper conversion, and you can get a cartridge refill kit at the Goulet Pen Company. I've written quite a bit with the included short international cartridge, and it looks like I've barely used any, so it's not like you'll have to replace the cartridge after just a few pages. In short, I highly, highly recommend this one. I think this one is a must for your collection, or it would be a perfect starter pen if you want to see just how amazing a fountain pen can be.